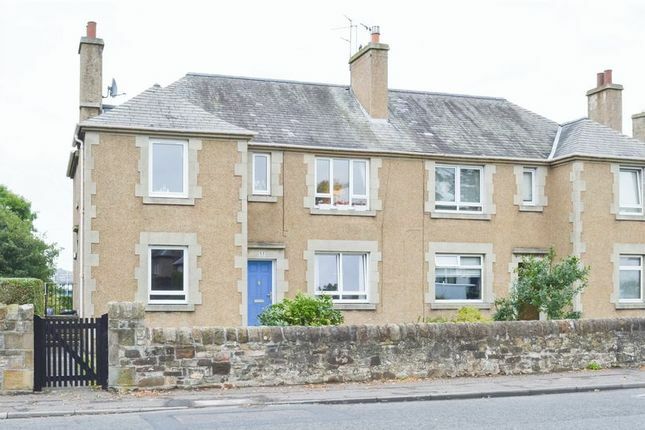 Freshly-decorated and good-sized two-bedroom lower villa located in the highly desirable area of Colinton, lying south-west of Edinburgh city centre. The property comprises an entrance hall, living/dining room, kitchen, two double bedrooms, and shower room. Features include gas central heating, modern uPVC double glazing, private front and rear gardens, and unrestricted on-street parking. The private front garden is south-west facing, and mainly laid to lawn with decorative brickwork. To the rear is a private, extensive and north-east facing rear garden, accessed via a wooden gate. Freshly-decorated and good-sized two-bedroom lower villa located in the highly desirable area of Colinton, lying south-west of Edinburgh city centre. The property comprises an entrance hall, living/dining room, kitchen, two double bedrooms, and shower room. Features include gas central heating, modern uPVC double glazing, private front and rear gardens, and unrestricted on-street parking. Colinton is well situated around an array of public parks and waterways including the Water of Leith, Colinton Dell, and Spylaw Park, and offers access to highly-regarded schools and a diverse range of amenities including restaurants, pubs and leisure facilities including Craiglockhart Sports Centre and Hillend Ski Slope. The property is well placed for those working in the city centre with regular public transport available on Redford Road. There is a wide choice of major supermarkets within a short radius, including Morrisons and Tesco, with a Waitrose store a little further afield in Morningside. The area provides quality public schooling at all levels, with the Merchiston schools and the private George Watson's College less than two and a half miles away. The entrance hall serves all rooms except the kitchen, and includes laminate flooring, a deep storage cupboard, radiator and pendant light fitting. Good-sized living/dining room with twin windows to the private front garden. Includes laminate flooring, built-in display cabinet, plain coving, space for dining furniture, curtain pole, curtains, radiator and pendant light fitting. The kitchen is accessed via the living/dining room, and has a window with a fitted roller blind looking out at the rear communal garden. Includes vinyl flooring, fitted units with laminate worktops, electric cooker, washing machine, freestanding fridge/freezer, wall-mounted boiler, stainless-steel sink, tiled splashbacks, extractor fan, radiator and central light fitting. Spacious and carpeted double bedroom with a window to the front garden. Includes inactive corner fireplace, curtain pole, curtains, radiator, pendant light fitting and ample space for freestanding furniture. A further carpeted double bedroom, with a window to the rear communal garden. Includes curtain pole, curtains, radiator, pendant light fitting and ample space for freestanding furniture. Located at the end of the hallway, the shower room has vinyl flooring, and a window with fitted roller blind facing the rear communal garden. Includes WC, hand basin, shower cubicle, tiled splashbacks, chrome heated towel rail, extractor fan and spotlight cluster. The private front garden is south-west facing and mainly laid to lawn with decorative brickwork. There is also a stone-built wall and an access gate from Redford Road. To the rear of the property there is a well-tended and open communal garden/drying area. Further to the rear is a private, walled, extensive and north-east facing rear garden, accessed via a wooden gate. Moveables are available by separate negotiation.